Heavy Duty another character from Collection 2 Wave 2 of the G.I. Joe: The Rise of Cobra toy line. 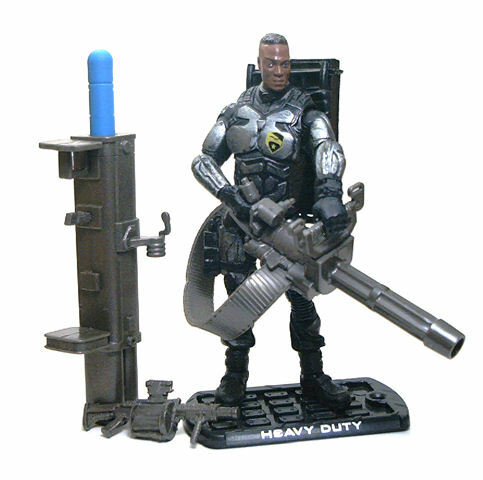 In the movie Heavy Duty serves as the heavy weapons specialist for G.I. Joe Team Alpha. The actor who portrayed the character is Adewale Akinnuoye-Agbaje, better known as Mr. Eko, from the Lost TV Series. 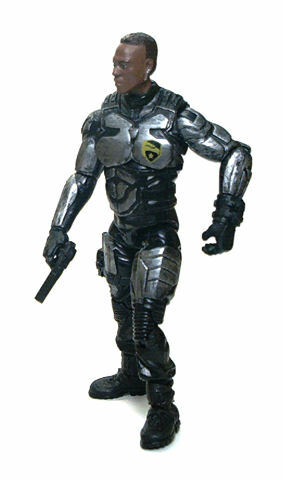 This version of Heavy Duty is outfitted with the Reactive Impact Armor, and given the size of the character, all of it had to be completely new sculpts. The legs look like fairly standard black BDU pants, with only the thigh plates linking the look with the rest of the suit. 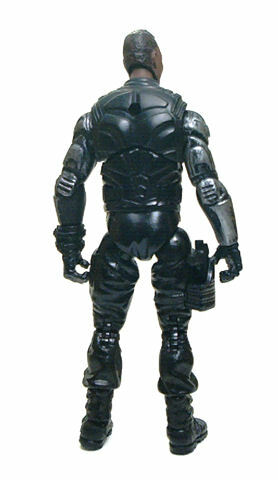 The sculpted armored plates on torso and arms are sharply defined and underneath the high-tech armor it is possible to glimpse bits of the black under-suit. All of the sculpted detail is really nice and full of tiny little bits like seams and clasps that help sell the feasibility of such a thing like a Reactive Impact Armor suit. Easily the most interesting part of the figure is the head sculpt, which captures eerily the likeness of the actor. Sadly the paintjob does not always come through in every sample of the figure I saw, with eye-paint issues being the most common. In the end I had to stop looking for a “perfect” sample and settle with a “good enough”, although I admit I can get rather picky at times. There is very little paint applications on the rest of the figure, since most of it is just black plastic, but the armored plates on limbs and the front of the figure were painted in gunmetal silver and given a thorough wash of black paint to make the edges pop out. Over the left breast Heavy duty sports the G.I. Joes crest neatly painted in black and yellow. • Ball jointed neck. Works great. Even though the ball rests rather deep within the socket it still manages to deliver a reasonable amount of tilt to the sides. • Peg & hinge shoulders. Excellent motion range. • Peg & hinge elbows. Excellent range of motion. The sculpted elbow pad isn’t conducive to free sideways swiveling, but it’s not a problem either. • Swivel wrists. No complains here, they work perfectly. As an oddity, the cuts on each forearm are done at different lengths, at wrist length for the right side, and one third of the forearm up on the left side. • Floating torso joint. Very good motion range, both tilting and swiveling. • Ball jointed hips. Standard G.I. Joe design, both offer a great range of motion. • Double-jointed knees. Excellent range of motion. • Peg & hinge ankles. These allow free sideways swiveling with excellent extension range. Heavy Duty comes with a very impressive array of accessories. 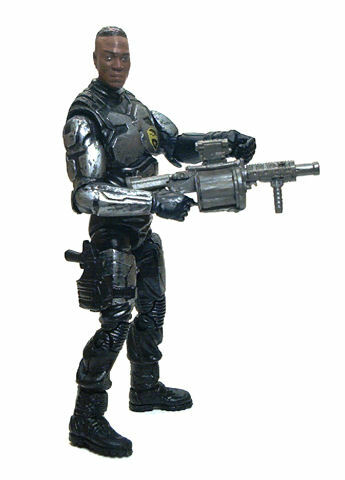 For starters, he has a Grenade Launcher (an M3, I think), molded out of dark gray metallic rubber and a pistol that fits the holster glued onto his right thigh. 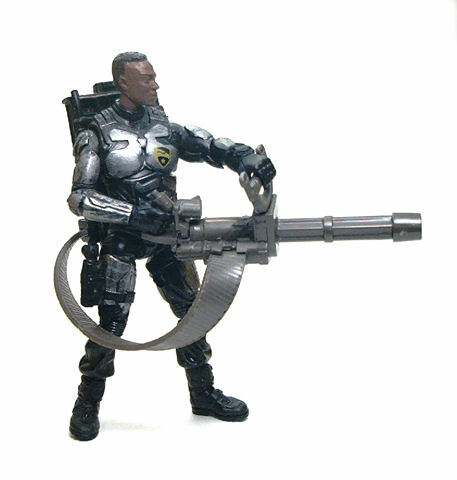 But the best piece of equipment is the portable gatling gun. Despite the sheer impossibility of any single man ever carrying, let alone use, what amounts to a gunship –grade piece of hardware, ever since we saw Jesse Ventura mowing down the south American jungle with one of these in the 80’s movie Predator, the concept has been ingrained so deep within the popular psyche that Hasbro couldn’t help but introduce such contraptions into their toy lines. Anyway, the design does make for very appealing imagery, and I am glad to report that this time the guys at Hasbro overdid themselves with the one included with this figure. The main gun looks very detailed and satisfyingly bulky, with all of the cylinders, barrels and support struts clearly visible. The length is just perfect for Heavy Duty to hold using both hands and there is even a forward frame with loops on it to slide a couple straps and customize a support sling, adding to the realism of the piece. The gun connects to the backpack by an ammunition belt made of flexible gray rubber, which could have been a little longer, by the way. The backpack is a nicely detailed with a lot of sculpted texture, but since it has pretty much no paint applied to it, most of the attention gets diverted towards the capital HD lettering picked out in bright green. Like most f the figures in this line Heavy Duty also comes with a big projectile launcher, and this time it is a reissue of the one included with the Desert Ambush version of Duke, which is a nice piece that manages to pass for a reasonably realistic accessory. 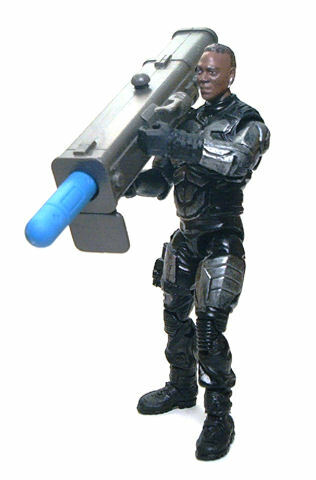 The launcher is molded of dark gray plastic instead of olive green, and the projectile itself this time is made out of blue plastic instead of bright yellow, which may or may not be less distracting, depending on your tastes. Last but not least, Heavy Duty also comes with his own display base. 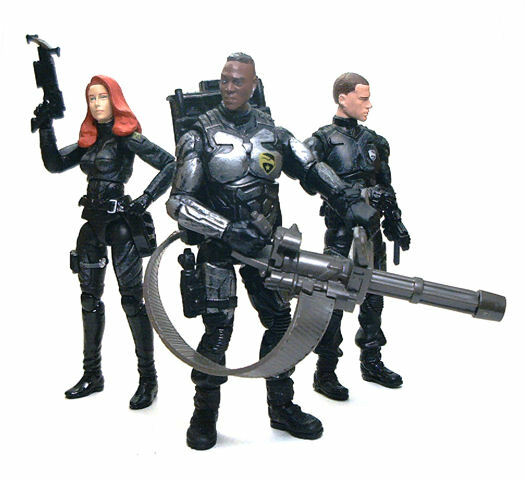 This is done in the Rise of Cobra style, black plastic shaped like a dog tag and silver lettering on the front indicating the character’s name. The main problem I’m having with most of the figures in these past couple of waves is that they are not quite flashy enough. I appreciate the consistent look on all of the characters wearing the same style of uniforms, but releasing them almost all together in a couple of waves maybe isn’t such a great idea, since I, as a buyer don’t feel as attracted to a figure wearing the same outfit I have already bought twice. In the case of Heavy Duty I am quite satisfied with it because it’s made all from new pieces, and the accessories are much nicer than the ones included with the Wave 1 version. I really wish the camo version came with this gun instead of the missile launching piece of junk. I agree. Problem with the green version is that the launcher thingie kind of ruins the look of two accessories, the backpack and the ammo feeding belt, although I do like the other machine gun in that version.